We have received an appeal for help in funding school hostels to help poor children stay in education - see the details under the News and Events Menu. Looking for a Lent Course? USPG's 2019 course "The Prophetic Voice of the Church" is focused on India. 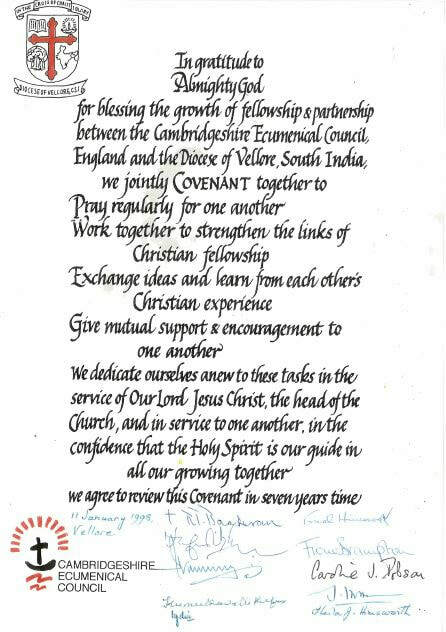 ​The link between Cambridgeshire Ecumenical Council and the Diocese of Vellore in the Church of South India was inaugurated at Bar Hill Ecumenical Church (Cambridgeshire) in September 1992. Since then three covenants between the areas have been signed in January 1998, January 2005 and January 2012. This website tells you about our partnership and working together, and how to be part of it. The Church of South India (CSI) was inaugurated on 27th September 1947; for the first time after centuries of historic divisions, churches with Episcopal and non­ Episcopal ministries were brought together in a united Episcopal church. Four different church traditions had been brought together in the CSI: Anglican; Congregational; Presbyterian; and Methodist. All these churches had been established in India through the missionary work of churches in Europe, America and Australia, who had started their work in India at different periods from the beginning of the eighteenth century. The Diocese of Vellore itself was inaugurated on the 26th of January 1976, making it the youngest of the CSI Dioceses. It was created out of the western half of the Diocese of Madras (now Chennai) as part of the CSI policy of creating more manageable sized dioceses for pastoral and administrative purposes. The territory covered by the diocese is the area that was first evangelised chiefly by the American Arcot Mission from the Dutch Reformed Church in America. (Arcot is a town on the Palar River in the north of Vellore District in the state of Tamil Nadu.) The Mission was active from 1853 until 1954, when it was dissolved and all its activities brought under the control of the Church of South India. Many of the institutions in Vellore Diocese still bear the names of their Dutch-American Mission founders; Scudder; Beattie; Wyckoff; DeValois, Honnegar. There is also an Arcot Theological Seminary at Sainathapuram. The motto chosen for the Diocese was “In the Cross of Christ I glory” (based on Galatians chapter 6 verse 14). The shield contains a St Thomas Cross, a map of India, a Bible, a lamp and a banyan tree. The banyan is a reminder of the tree under which Henry, Joseph and William Scudder prayed before they decided to begin their work in the area of Vellore. Vellore Diocese is predominantly rural and crosses the state boundaries of Tamil Nadu and Andhra Pradesh; this means it is a bilingual diocese with Tamil being spoken in the south and Telagu in the north. More than 90% of the Christians come from the Dalit community. The diocese has 78 pastorates (each pastorate may include several rural churches), plus 99 elementary schools, 5 high schools, 1 higher education college, 2 hospitals and a number of training institutes. Rt Rev’d Rajavelu became the sixth Bishop of Vellore in July 2012. The town of Vellore itself is famous across the world because it is the home of the Christian Medical College, founded by Ida Scudder. In this century, it has also seen the birth of the Vellore Institute of Technology, an internationally acclaimed private engineering college, and The Golden Temple, which pilgrims come from all over India to visit.